Nest today announced the $169 Nest Thermostat E, a more affordable version of its original $250 smart home thermostat from 2011 with most of the same features, but with a less conspicuous design. Replacing the metallic look of its predecessor, the new HVAC energy-saving device features a soft-touch plastic white control ring around a black display, which lies behind a frosted screen to make the thermostat blend in to most home environments. The display itself offers a more basic readout than previous Nest's, showing the temperature only. When the frosted display is off, the screen is grey. When it’s on, it displays soft text and images that are designed to be easy to see and read with a slight glow. The display uses an ambient light sensor to share information at just the right brightness. Meanwhile the unit's innards have been simplified, which means the Thermostat E doesn't offer the same wide compatibility with various U.S. domestic setups as the pricier device, so check before ordering. Like the original Nest, the Thermostat E learns the user's temperature preferences over time, smartly adjusting them on the fly depending on the circumstances. Alternatively, the Thermostat E can be set up on a simple schedule, based on an average of thousands of schedules already learned by the company's devices. Users can adjust temperature using the control ring or via Nest's iOS app for remote access. The Thermostat E costs $169, while the original Nest Learning Thermostat will remain available to buy for $250. 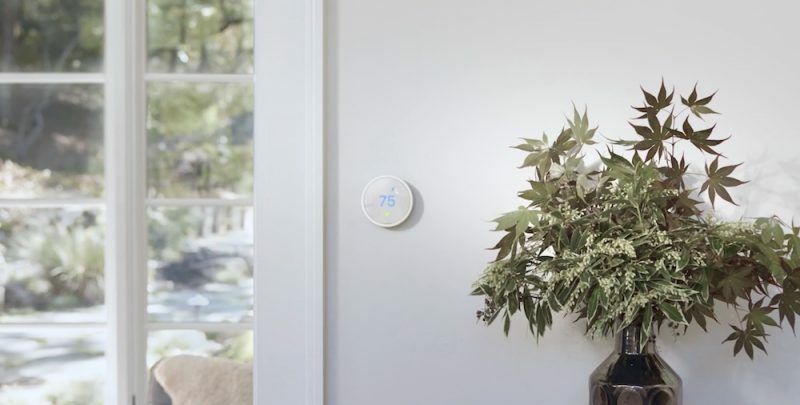 The new thermostat can be ordered from Thursday on the company's website, with shipping set to start on September 1 and availability in retail stores from September 10. Me: "Hey Siri, lower the temperature"
Siri: "It's currently 90 degrees in Denver, HOT!" Me: "No, lower the thermostat." Me: "Hey Siri, lower the thermostat." Me: <Holds down home button>"Lower the thermostat." Siri: "Here's what I found on the web for thermostat." Me: "Seriously, what the f***?" Siri: "Sorry, I don't understand 'What the duck?'" Other than Siri integration what else can HomeKit do that the Nest app can't? It already adjusts the temperature based on my location, what else is there? It's an extra step, but once you have it set up, you'll never know the difference, and Siri and the Home app will let you control it just like any other thermostat with HomeKit support out of the box. Looks really nice. Too bad it doesn't have HomeKit. The only other thing there is? Integration with literally anything else in HomeKit. Say, set up a rule to turn on the AC as soon as you unlock the front door. Turn it back down if you open the living room windows. Make your lights flash if the heat drops below a certain threshold because the furnace didn't ignite. You can even turn on the Nest's ventilation feature if your HomeKit sensors find the CO2 value is too high. That's pretty awesome. If all this fancy stuff is not interesting to you, that's fine. ¯\_(ツ)_/¯ But it's silly to act like all this functionality is useless. Oh, and I quite enjoy telling my watch to turn on the heat. There is a set vocabulary of HomeKit commands that Siri recognizes. I've had no trouble "screaming" at Siri. * Home app integration: With a flick of Control Center or Home app, you can get status of all your HomeKit devices. I launched Home app just now and I see that all the lights and thermostats are off, 67-69 degrees, doors are locked, garage door is closed, and window shades are up. * Manufacturer independence: Even if manufacturer goes out of business or stops supporting the device, if it's a HomeKit device, it will continue to work. * Automation integration: There are workarounds, such as IFTTT, Alexa, etc., but you can also use HomeKit to automate tasks. If thermostat sensor reads 90 degrees, roll down the window shades. If occupancy sensor from thermostat in the living room is not triggered, turn off the lights in the living room. And frankly, I like Siri. It's sometimes flaky but it's getting better. HomePod should add even more values to Siri. 1) On an outside wall? 2) Next to a door/window? I really really really that plant next to the Nest machine thing. We bought a Nest 4 years ago and its one of the best purchases I've ever made. I have the 1st gen Nest and overall like it. However, until they start supporting HomeKit, I have zero interest in buying another Nest product.